The unprecedented impact of Information and Communication Technologies (ICTs) on nearly every facet of human endeavour has continued to attract individual and organizational interest to explore these technologies for specific cause. ICTs are increasingly being used in promoting democracy and human rights issues: to mobilize and strengthen solidarity, increase communication among interest groups, and share information more quickly. There is no doubt that ICTs deployment in Nigeria and other developing countries has sparked growth in citizens' abilities to communicate and share ideas, but there are impediments. This chapter looks at the evolution of ICTs in Nigeria, the place of ICTs in promoting democracy/human rights, and discusses the challenges of harnessing the enormous benefits of ICTs in promoting democracy and human rights in Nigeria. Information and Communication Technologies (ICTs) have emerged to be significant tools for human development. The 21st century and the beginning of the new millennium have marked many changes in the way the world thinks and functions. Perhaps the most significant of these are the glaring developments in the sphere of information and communication technologies (ICTs). We now live in the information age with tools of information being more sophisticated and effective than ever before (UNESCO, 2007). ICTs have opened up new horizons for unimaginable exchange of information, knowledge and ideas. These technologies have in no little way influenced nearly every area of human endeavours such as education, livelihood, communication, healthcare, social behaviour, etc. ICTs have opened-up areas that used to be an exclusive preserve for very few in the society. For example, international trade and businesses were in recent past a preserve for the affluent in the society, but today ICTs have made it possible for a rural-based cocoa farmer in Africa to contact buyers any-where in the world to sell his products in good price. A fish farmer in a village in Yobe State, Nigeria can contact a five star hotel in London to buy his fish. Man’s yearning for freedom and a system of governance by the people and for the people are to some extent met by use of these new technologies. For example, governance in most countries used to be strictly top-down approach; a system that gives citizens little or no opportunity to make inputs in affairs or issues that concerns their wellbeing. The majority globally had little opportunity to express themselves because they lack the means or channels to do so. The scenario is different now with the emergence of ICTs. Horrocks and Prachett (1995) note that ICTs offer the promise of an information rich-society: one in which citizens have access to a wide range of information from a variety of sources; one in which every issue is extensively debated amongst citizens and policy makers through interactive media; and also a society in which participation in the political process is greatly increased. It is interesting to note that citizens in diaspora now have the opportunity to participate in electoral processes such as campaigning for a candidate of their choice and even voting in the diaspora. In recent times, promoting democracy and the protection of human rights through the use of new communication technologies have become areas of growing interest, which involves working towards the betterment of governance mechanisms and the growth of a global civil society that is characterized by equity (International Telecommunication Union, 2005). These strides as a result of ICTs have compelled governments to formulate policies to harness the utilization of ICTs for the larger benefit of mankind. Like other countries of the world, Nigeria is not left out in the pursuit for providing an enabling environment for ICTs access and usage to thrive. For example, it has an Information Technology (IT) policy designed to bring ICTs to bear in every facet of its national endeavours. Based on its IT policy, it would not be out of place to say that Nigeria has joined the League of Nations where ICTs are being explored for various purposes. For example, the Independent National Electoral Commission of Nigeria (INEC) has adopted the use of ICTs for electoral processes such as electronic voter registration, submission of election results via email to the headquarters, publishing of election results, voters education etc. These are some indicators of the use of ICTs in democratic process in Nigeria. The National Human Rights Commission of Nigeria has a website that informs and educates people on its activities (see http://www.nigeriarights.gov.ng/). Other areas these technologies are being employed in Nigeria include: agriculture, trade, broadcasting, tourism, consumer protection, medicine etc. However, there are challenges militating against the effective utilization of these technologies in the various fields of human endeavours to achieve desired results. 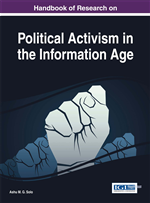 This chapter examines the state of ICTs in promoting democracy and human rights in Nigeria. It also looks at the problems associated with the use of these technologies.